All Summer long I make as many raw and cold dishes as I can think of to avoid turning on the oven. Well, I am happy to say my oven is now cranked up and roasting vegetables regularly. Look at these 2 beauties above - white acorn squash and carnival squash - both from a farm in Pennsylvania. The white acorn looks especially ghost-y, and who doesn't want to eat something with the word carnival in its name?! They are seasonal showstoppers on the inside as well. It is a word from Finland. The Finns believe that Autumn leaf color acts as a messenger of sorts; it bids a melancholy farewell to long summer days and serves as a reminder of the dark and cold winter that looms around the corner. What poetry! Gloomy…but poetic. My first Autumn in New York in 1994 I took a day trip all by myself to Wave Hill. It is a sprawling public garden and estate once leased by Mark Twain. Teddy Roosevelt's family rented out Wave Hill during the Summers of 1870-71. It is truly a special place. In 1994 I am sure I was bidding my own little farewell to my Missouri high school and college days. The dark and cold unknown New York winter was definitely looming around the corner. In my exploration and contemplation of the grounds, I found the most stunning leaves at my feet. Ridiculously vibrant colors like no Fall leaves the Midwest had ever offered me. I saw the normal oranges, reds, yellows, and browns, but there were also pinks, blues, and purples! I gathered up the prettiest leaves and on the way home I went to a Kinko's. I laid my seasonal souvenirs out on a sheet of white paper and photocopied them so I could preserve the colors long after the real leaves crumbled away. Every year I would hang the copied paper on my door to remind myself how far I had come from that first New York Autumn. That paper was like a flag I waved honoring my past. I just turned my office upside down trying to find that very sheet to scan and upload to share with you on this blog. Sigh. It is not to be found. Or shared with you. But that's okay. So often we cling to the situations of our past. The titles, the relationships, the coping methods, the talismans, whatever. They begin to define us. Which is really investing in the past. And how will that ever really benefit us as we move forward in life? So instead I am offering up the memory of what those leaves represented. I’m choosing to fall forward into my future and not fall back into the memory of who I was. (I've come a long way whether the photocopied leaves show up to add to the story or remain missing.) Right now, there is present day ruska happening outside my window and I have squash roasting in the oven. Here's to all the Autumns ahead of us! Trim the end off one acorn squash. Stand it on its now flat end to give you stability (and safety) for cutting the squash in half. Remove seeds and membranes with a spoon. With the squash on its even longer flat side, begin to slice half moon shapes. Repeat with the other squash half. Arrange the slices on a cookie sheet that has been sprayed with nonstick spray. Drizzle the squash slices with olive oil and sprinkle with salt and pepper. Roast in a 400degree oven for 20 minutes, flipping the squash after 10 minutes. Drizzle with balsamic caramel and fresh thyme leaves. To make the balsamic caramel, place 3tablespoons of balsamic vinegar and 1 1/2 tablespoons of sugar in a small saucepan. Bring to a boil, then decrease the heat and simmer for 2 to 4 minutes, until it thickens. Be sure to remove the pan from the heat when the vinegar is still runnier than honey; it will continue to thicken as it cools. Stir in a drop of water before serving if it does become too thick to drizzle. Reserve in a sealed glass jar and bring it out to drizzle on everything. It is delicious! Cut one carnival, acorn, butternut, or delicata squash in half through the stem and scoop out seeds and membranes. Coat insides lightly with olive oil and season with salt and pepper. Place squash halves on a cookie sheet, cut side down and roast in 400degree oven for 25 minutes. Melt 1 tablespoon butter in a skillet over medium heat. Add 1 cup shredded green cabbage to the butter and stir. Cook until softened. Add one cup cooked quinoa to the skillet and stir. Add 2 tablespoons toasted pine nuts to the mixture. Season with salt and pepper. Remove from heat and add 1 tablespoon grated Parmesan cheese. 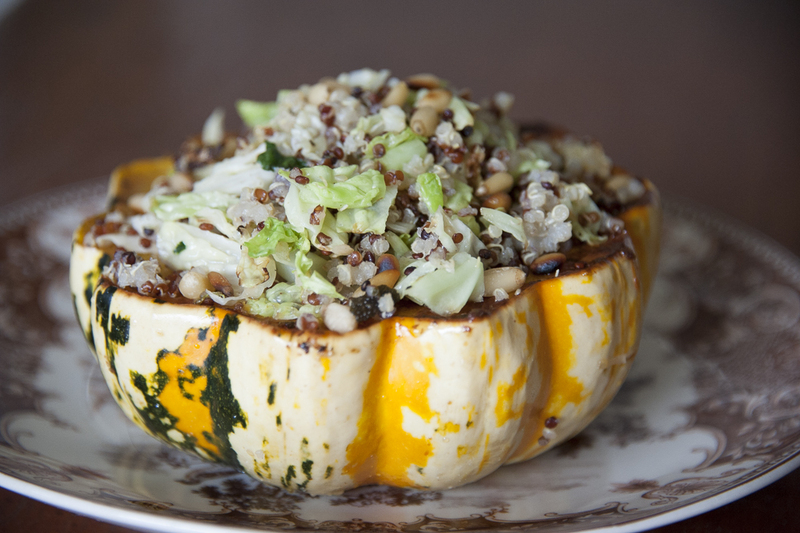 Stir everything together and spoon into roasted squash halves. Sprinkle with fresh thyme leaves and more grated Parmesan cheese. Photos are by Cheryl Stockton of Stockshot Studios.